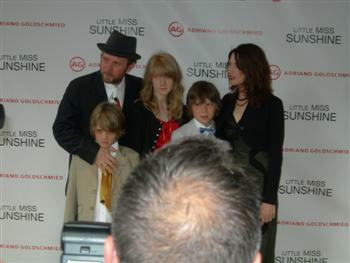 Directors - Jonathan Dayton and Valerie Faris and family. 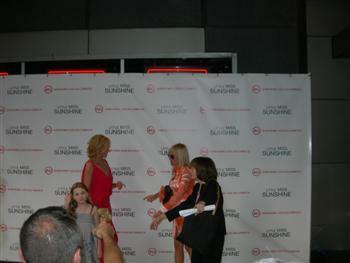 (Oh and some paparrazzi's head) Toni Collette and Abigail Breslin and their publicists. Can you guess who belongs to who? 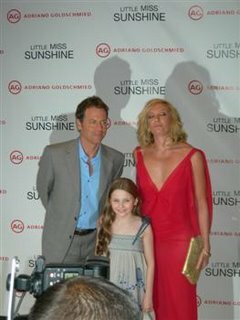 Greg Kinnear joins the girls. Toni Collette, over the shoulder, over the shoulder the paparrazzi's yell Joan Allen was not in the film but was a guest at the premiere. She looks HOTT and I see how she keeps looking so young. That guy has to be 10 years her junior. I saw the movie last Thursday and it was great. So funny. If you liked Napoleon Dynamite, you are gonna love this little gem.